Ford revealed the next generation 2009 F-150 design at Detroit's North American International Auto Show in January, 2008. Production of the series began in October 2008 at Ford's Kansas City Assembly Plant. The truck features a larger and more flexible interior, an updated three-bar grille, and additional choices of cab styles and trim levels. The chassis includes lighter-weight, high-strength steel for better fuel economy and safety and improved payload and towing capacity. Three engines were initially offered with the 2009 redesign: a revised 5.4 L 3-valve Triton V8 that is E85 capable with an output rating of 320 hp (240 kW) and 395 lb·ft (536 N·m) of torque, a 292 hp (218 kW) 4.6 L 3-valve V8, and a 248 hp (185 kW) 4.6 L 2-valve V8. The 3-valve 5.4 and 4.6 liter V8s are mated to Ford's new 6R80E 6-speed automatic transmission while the 4R75E 4-speed automatic transmission used previously is carried over for the 2-valve 4.6 L V8. The 4.2 L OHV V6 engine, which was previously available, has been dropped due to the closure of the Essex engine plant where it was produced. The manual transmission option was dropped in 2009. 2009 was the last year when Flareside Box was available, and the last year when the 17" wheels for the FX4 Off-Road were available. In 2010 the only box will be Styleside, and the base wheels for FX4 will be 18". For the 2011 model year, an all-new engine lineup is offered. Two of the engines, a 3.7 L V6 and a 5.0 L V8, are based on the 2011 Ford Mustang engines, and both offer E85 flex-fuel capability. The 6.2 L V8 used in the 2011 Ford Super Duty is available with the F-150 Platinum, Lariat, SVT Raptor, and Harley Davidson editions. 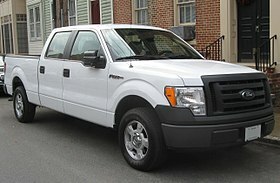 Finally, the 3.5 L direct-injected twin-turbo EcoBoost V6 was offered in the F-150 starting in early 2011. All engines are paired with a new six-speed automatic transmission (6R80). Electric power-assisted steering is available on all engines besides the 6.2. Since 2008, the Ford F-150 has towing and hauling capacity of 11,300 lbs and 3,060 lbs, respectively. In 2012, the F-150 gets a nine-grade lineup (XL, STX, XLT, Lariat, King Ranch, Platinum, Harley-Davidson Edition, SVT Raptor, and Limited). Ford originally planned to reintroduce the F-100, known internally as P525, as global replacement for Ford Ranger in 2010 or 2011, but the plan was cancelled, instead offering EcoBoost engines for the F-150. The F-150 comes standard with AdvanceTrac Electronic Stability Control, front and rear row side curtain airbags, and front row torso side airbags. In the Insurance Institute for Highway Safety (IIHS) crash tests the F150 received the Good overall score in both front and side impact tests and was given the Top Safety Pick award. The SVT Raptor entered showrooms in late 2009 as a dedicated off-roader. It debuted in 2010 and sales were much better than expected. It was powered by a 5.4 L (330 CID) engine, with a 6.2 L option. The 6.2 L (379 CID) engine has 411 horsepower (306 kW) and434 ft·lbf (588 N·m) of torque. The suggested retail price was $3000 over the 5.4 L model. A six-speed automatic is standard.It has Fox Racing Shox internal bypass shocks with external reservoirs which allows for 11" of suspension travel in front, and 12" in the rear. It comes standard with 35" BFGoodrich All Terrain tires, and a rear Locking differential with a 4.10:1 gear ratio. Also, it is available in solid black, white, blue, and orange with a "digital mud" decal scheme as an option. In April 2011, Ford sold 1,186 Raptors, outselling Honda's Ridgeline. The first production Raptor, orange with the digital mud graphic, sold at an auction for $130,000. Ford donated all proceeds above the MSRP to charity. The race version, F-150 SVT Raptor R, was built for the Baja 1000 races. It uses a 6.2 L engine rated at 500 hp. For 2011, the SVT Raptor would be powered exclusively with the 6.2 L V8 as the only engine choice. Other notable changes to the 2011 SVT Raptor include availability in a 4-door Super Crew cab and a new color option Ingot Silver Metallic making the Raptor available in a total of five colors. From the A-pillar forward, the Raptor has a composite hood and fenders different from other F-150sand is bereft of the blue oval badge in the grille. SVT widened the track by 7 inches, and so its 5.5-foot box is unique to the Raptor as well. The Raptor's height is 2 inches over a standard Supercrew. It also features new, internal bypass shocks, designed by Foxx Racing Shox. The Raptor has new leaf springs and shocks, new front upper- and lower-A-arms, and a wider, thicker-walled rear axle. It's the first Ford with hill-descent control and comes with an electronic differential locker that lets the driver keep it locked at high speeds when the Raptor's Off Road Mode is engaged. Off Road Mode is a feature unique to the Raptor which allows more controlled, aggressive driving while in situations where increased traction and braking are necessary. The Raptor's Off Road Mode allows ABS, roll stability control and traction control to be completely turned off giving the driver total control over the driving experience. Off Road Mode also changes the Raptor's throttle sensitivity and transmission shift points causing a more linear power curve for low traction situations. Towing capacity is up to 8,000 pounds with a 1,770-pound payload (Super Crew only). Interior changes include high-bolster seats, a special steering wheel, a redesigned center console and auxiliary switches connected to pre-wired pass though leads allowing ease of aftermarket product installation. Ford originally promised a value price and a multi-year run—final pricing came in at $42,000.00 for 2010.